Here we are basking in the dusk of last evening at Pica Pica Maize Kitchen, the new Venezuelan quick-service stop, on Valencia and 15th. You'll see above, the space is quite tidy and dialed-in design-wise, with all the bold colors and zebra wood we mentioned in our earlier report. 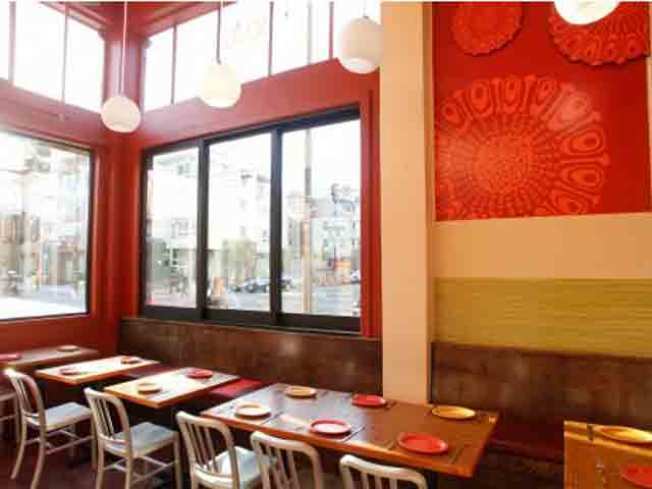 Pica Pica is owned by Adriana Lopez Vermut and her dad, Leopoldo Lopez Gil, who are both originally from Caracas, Venezuela and started the Pica Pica concept at Napa's Oxbow Market in 2008. If all goes as planned, the father-daughter duo should unveil their Mission outpost on Monday with weekend brunch, outdoor seating, and brewers' events coming soon thereafter. For a look at the full menu, brimming with all-natural, corn-based empanadas, arepas and cachapas, do click here.